The New York City Transit Authority (NYCTA) is a division of the Metropolitan Transit Authority (MTA). The NYCTA is responsible for the operation of the subway system, as well as many city busses. The Transit Authority is responsible for providing passengers with safe transportation and properly maintained transportation vehicles. If you have been injured in an NYC transit accident involving a subway or train, you may be entitled to compensation for your injuries. The Orlow Firm encourages injured victims in Brooklyn to take action quickly to ensure their rights to sue are not forfeited. You should file a claim with the NYC Transit Authority within 90 days after your accident. You should also call our firm at (646) 647-3398 to schedule your free consultation. 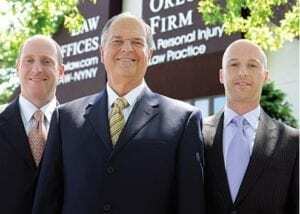 The Orlow Firm was established in 1981. Our attorneys have extensive experience protecting the rights of injured New Yorkers and obtaining substantial verdicts and settlements. We can readily identify complications that may arise in an injury claim, including those complications involving liability. Proving liability in cases involving the NYC transit authority can be difficult, and we work to develop tightly argued cases for every injured client. Whether you were injured in a train derail accident or in a subway accident, our firm has the experience and dedication to fully understand your claim and seek maximum compensation for your loss. At The Orlow Firm, we take all cases on a “contingent” basis. A contingent fee means that the attorneys are paid only at the time when, and if, you recover money damages. A contingent fee allows an injured person with little or no money to obtain competent legal assistance. At the time recovery is obtained, the attorneys’ fee is a percentage of the award in the case. If there is no recovery, there will be no attorneys’ fees. Free consultation: If you or a loved one suffered in a Brooklyn transit accident and you are wondering if you have a legal claim, our qualified and experienced lawyers will offer a confidential and honest assessment of your case. Contact our office today by calling (646) 647-3398.